We’d love your help. Let us know what’s wrong with this preview of No-Drama Discipline by Daniel J. Siegel. 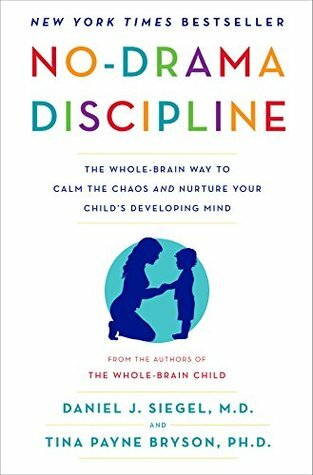 Highlighting the fascinating link between a child's neurological development and the way a parent reacts to misbehavior, No-Drama Discipline provides an effective, compassionate road map for dealing with tantrums, tensions, a NEW YORK TIMES BESTSELLER - The pioneering experts behind The Whole-Brain Child and The Yes Brain tackle the ultimate parenting challenge: discipline. To ask other readers questions about No-Drama Discipline, please sign up. I really liked this book. Would you recommend also reading Whole Brain Child and/or Yes Brain? Curious if it is more of the same or if there is other useful material. Thanks!!! How different is this book from "The Whole Brain Child", by the same authors? This book has a lot of excellent advice about the importance of your relationship with your children, and how you can "discipline" them in a way that preserves that relationship. I use quotes around "discipline" because the authors begin the book by launching into a sort of questioning of what we even mean by "discipline". They wind up redefining the word to mean something a little different from what you might expect (i.e. "to teach" rather than "to guide by consequences" as many parents have c This book has a lot of excellent advice about the importance of your relationship with your children, and how you can "discipline" them in a way that preserves that relationship. I use quotes around "discipline" because the authors begin the book by launching into a sort of questioning of what we even mean by "discipline". They wind up redefining the word to mean something a little different from what you might expect (i.e. "to teach" rather than "to guide by consequences" as many parents have come to understand it), and then proceeding to offer advice based on this new definition rather than the one with which you're familiar. All of the advice seems really great--it's loving, centered, and respectful of both parents and kids. But it feels like there's a huge missing piece: while the authors repeatedly speak about "boundaries" and "limits", they also preach firmly against "consequences" or "punishment". It's easy to see where they're coming from: handing out these painful forms of discipline is rough on the relationship and can engage anger rather than creating an actual teachable moment. On the other hand, the form of discipline they advocate is almost completely toothless. Every time your child misbehaves you're supposed to set aside time to "connect" with them and "redirect" later to discuss the behavior. One wonders if children will really feel there's a limit or boundary if nothing other than an acknowledgement that they've crossed it is forthcoming from Mom and Dad. In the book, almost every one of the example "interactions" end up with the child tearfully confessing their crimes, explaining their inner motivations, and working collaboratively with their parents on a solution. I don't know about your kids, but mine look me right in the eyes and tell me that they're just going to misbehave again! Despite the many references to brain physiology, there is little to recommend this book scientifically. The advice is based on anecdotes, not research, and on a vastly simplified and dichotomous view of the brain. I also felt like this book was of tremendously inflated size. Many paragraphs end with a variation on the following sentence: "And, by doing this, you'll not only help your kids cooperate in the short-term, but help their growing brains, giving them skills to last a lifetime!" After reading that sentence for the twentieth time, you may wish the authors had followed their *own advice* and used fewer words to greater effect. Melissa Thank you for the correct link! This is worth a read from the library but please don't buy this book! What is said on 250 pages could be summarized in 15 and by making it longer the authors complicate a simple strategy. In short: connect with your kids and focus discipline on learning rather than consequences. I will have to try it before I judge the merits of the strategy. Much of the advice runs counter to almost every parental instinct I have. Eg, if your child throws your glasses against the wall, make a joke to lighten th This is worth a read from the library but please don't buy this book! What is said on 250 pages could be summarized in 15 and by making it longer the authors complicate a simple strategy. Before tackling this book, the reader must understand a secret that is essential to good parenting; there is no 'perfect parent' or 'ideal' approach to tackling the issues of disciplining a child. Drs. Daniel Siegel and Tina Payne Bryson dispel this myth from the beginning and offer an insightful and highly educational approach to discipline and parenting that is simple, yet effective. With strong parallels from their previous joint publication (The Whole Brain Child), which I have previously re Before tackling this book, the reader must understand a secret that is essential to good parenting; there is no 'perfect parent' or 'ideal' approach to tackling the issues of disciplining a child. Drs. Daniel Siegel and Tina Payne Bryson dispel this myth from the beginning and offer an insightful and highly educational approach to discipline and parenting that is simple, yet effective. With strong parallels from their previous joint publication (The Whole Brain Child), which I have previously reviewed, the authors tackle discipline from a non-punitive perspective seeking the "teachable moment" approach for both parent and child. With a better understanding of the child's brain, the parent can fine-tune their end results to best align with what the child has going on and how the message reception plays an integral role in the final product, hopefully a cessation of the issue at hand. Siegel and Bryson make reference to their previous work and the different parts of the brain, as well as how disciplining from the lower, more reptilian, brain can lead to gross exaggeration and emotional messes that could take years to rectify. By talking and redirecting over punishing and lecturing, the authors propose that a child and their brain will become no only more receptive to addressing issues, but also more capable of digesting behaviours in need of change. While some sections may leave even the more tapped-in parent wondering where the parental power may have gone in this approach, Siegel and Bryson assure the reader that all is not lost, even if the magic wand is no longer in play. Well-written with honest examples and keys to success, Siegel and Bryson offer up a wonderful guide to address discipline issues from an emotionally calm and drama-free approach, leaving time for the parent and child to tune into an episode or two of DAYS OF OUR LIVES and see how well adjusted they are, compared to some families. This is the second 'parental discipline' book that I have read in the past few months. With a child in his Torrential Threes, I sought out some helpful advice to tackle issues of defiance, acting out, and even outright ignoring. While the book has some sound approaches to it, it contradicts some of the previous literature that I have read by another well-known and respected parenting expert. Such is the peril that any parent (or reader) will encounter when reaching out for assistance. I was pleased to see Siegel and Bryson speak of not "running one's life based on the manual of one expert or another while ignoring parental instinct", for that is what I feared I would do. Children are as unique as ice cream flavours, and the parent knows their child better than any academic or psychologist. At times, it takes a nudge in the right direction to tune into those frequencies the child emits, but we cannot discount our own intuition in finding an effective way to parent and discipline the child. I especially enjoyed the 'discipline is not all about punishment' approach, for I never saw the difference. Boiling discipline down to being a set of teachable moments, the parent can reins in behaviours and teach from a 'how well is this working?' angle, rather than a 'punish the behaviour out of you' approach. If I took one thing away from this book, it is that. Our children are the future and if we can get in better touch with their feelings and development (mentally, physically, and emotionally), we are well on the way to raising happier, healthier, and more well-adjusted children. Then we can see those life lessons flourish when grandchildren come along. That said, don't spill your secrets too readily; you had to learn them the hard way too! There is no silver bullet to parenting and the authours rightly confess this in the book. There is a lot of useful advice here and much to like and enjoy in this book. But like any 'parenting' book, it seems to have been written in the land of parenting utopia where every 'explosive situation' is scalable and every child, given time, can see the errors of their ways. If your household is anything like mine, we don't have this luxury. That being said the 'message' of this book is simple, and on the whole, a commendable one. Connect with your kids, keep calm and try and avoid any nuclear episodes. I'm all for 'modern' parenting. Teaching through example, being tender and the rest of the mantra that goes into this book but I can also see the merit of taking the hard-line when needed. Parenting, like anything thing in life, is very situational. No one knows your kids better than you (hopefully), and knowing this should give one enough confidence to dealing with discipline situations appropriately. When I saw the title of this book, I rolled my eyes and thought “No drama? You haven’t met my child.” As I started reading, I appreciated that the authors had a generally realistic approach to children and were thoughtful about how they connected their philosophy and suggested strategies to brain development. It had some helpful, catchy things to remember (like “shark music”). The examples seemed like real-life ones and every situation did not end perfectly. I liked all of these things. However, When I saw the title of this book, I rolled my eyes and thought “No drama? You haven’t met my child.” As I started reading, I appreciated that the authors had a generally realistic approach to children and were thoughtful about how they connected their philosophy and suggested strategies to brain development. It had some helpful, catchy things to remember (like “shark music”). The examples seemed like real-life ones and every situation did not end perfectly. I liked all of these things. However, in the end I felt the book didn’t offer me much, even though on the whole I agreed with most of their approach. Something I noticed early on was the total lack of reference to existing discipline approaches. The strategies and philosophies described in this book borrow quite a lot from discipline approaches such as Jane Nelson’s “Positive Discipline,” Adele Faber and Elaine Mazlish’s “How to Talk So Kids Will Listen,” Elizabeth Pantley’s “The No-Cry Discipline Solution,” and Alfie Kohn’s “Unconditional Parenting” (and probably others that I’m not aware of). It felt very disrespectful that the authors did not acknowledge others’ work in this area. For example, relating to the “redirect” strategies given here, the chapter in “How to Talk…” includes many of the same strategies (but is much more detailed and specific). This is a fantastic book; I would really like to adopt Siegel and Bryson's very well-informed and well-tested discipline philosophy. Their philosophy does seem to require more thought, creativity, and engagement with your child than the average parenting style. I think that my husband will be great at this, but I'm worried for myself about doing a good job with the creativity part. The philosophy in a nutshell is that you first connect with your child--meaning that you have a discussion or a few This is a fantastic book; I would really like to adopt Siegel and Bryson's very well-informed and well-tested discipline philosophy. Their philosophy does seem to require more thought, creativity, and engagement with your child than the average parenting style. I think that my husband will be great at this, but I'm worried for myself about doing a good job with the creativity part. In correction, aka redirection, aka discipling (not a typo--they do talk about the relationship between discipleship and discipline even though it's not a religious book), you first think about what you want to teach your child, which may not be the same thing even for the same infraction from one time to another. One goal is to help your child develop empathy. Part of this will often involve discussing with your child what they can do to make things right. Siegel and Bryson advocate being consistent but not rigid and helping your child develop emotional intelligence in the long run. They do talk about how to begin this process with toddlers who can't participate in the process in the same way an older child can. I enjoyed the basic ideas in this book, and appreciated the gentle, logical solutions presented. They are helpful ideas. But like SO many other parenting books, the tone is repetitive and a little arrogant - and it doesn't acknowledge that what parents need perhaps more than anything is grace for themselves, grace their children, and a sense of humor. I wish more parenting authors would just acknowledge that at one time or another, your child will be the hot mess melting down in a very public pl I enjoyed the basic ideas in this book, and appreciated the gentle, logical solutions presented. They are helpful ideas. But like SO many other parenting books, the tone is repetitive and a little arrogant - and it doesn't acknowledge that what parents need perhaps more than anything is grace for themselves, grace their children, and a sense of humor. I wish more parenting authors would just acknowledge that at one time or another, your child will be the hot mess melting down in a very public place. Your child(ren) will pick up bad habits and present discipline challenges that will exasperate you. And none of that makes you a bad parent. Viena no grāmatām, kas jēdzīgi un praktiski maina vecāku un bērnu attiecības. Ar dažiem vārdiem, dažām idejām. *) Disciplīna - kas savā sākotnējā vārda nozīmē (no latīņu valodas) - ir “zināšanas”. *) Connect & Redirect - pirms mainīt uzvedību, nonākt kontaktā. *) Kā Šerlokam Holmsam vienmēr meklēt atbildi uz jautājumu “Kāpēc?”, nevis dzīvot pieņēmumos, kas sāpina gan pašu, gan bērnu. Labvēlīgi un iedrošinoši. Lai saprastu, kāpēc nedaudz arī skumji, domāju izlasīt vēl vienu Sīgela grāmatu “Paren Viena no grāmatām, kas jēdzīgi un praktiski maina vecāku un bērnu attiecības. Ar dažiem vārdiem, dažām idejām. All parents should read this. Great reminder of what is important. Highly Recommended by my neighbor. This book suggests that disciplinary moments are opportunities for parents to develop the executive function of their children’s brains. It presents a “connect, then redirect” model whereby parents first focus on connecting emotionally with their children to deescalate heightened situations and then work with them to redirect behaviour to a more positive outcome. It’s definitely too early for me to use this information now, but I’ll be revisiting this book in the future for sure!! You can kind of skip the book and read the “Connect and Redirect Refrigerator Sheet” in the Resources section without missing much content. I’d prefer the anecdotes be replaced with research and sources. Bütün Beyinli Çocuk kitabının yazarından olan Dramsız Disiplin kitabı, bağlantı ve sevgiyle çocukları disipline etmenin yollarını gösterirken, kendimize şefkat göstermemiz gerektiğini de vurguluyor. I can't speak highly enough about this book. It explores the link between a child's neurological development and the way a parent reacts to misbehavior. Written in a clear and compassionate style, the authors present a research-based approach to viewing discipline as "teaching" rather than "punishing". It explains how a child's brain is--quite literally--immature, and how parents can help our children through difficult emotional times by connecting with them, helping them to calm down and access I can't speak highly enough about this book. It explores the link between a child's neurological development and the way a parent reacts to misbehavior. Written in a clear and compassionate style, the authors present a research-based approach to viewing discipline as "teaching" rather than "punishing". It explains how a child's brain is--quite literally--immature, and how parents can help our children through difficult emotional times by connecting with them, helping them to calm down and access their "upper brain" where true learning and growth can occur. It stresses the important of consistency and boundaries, but within a framework of connecting lovingly with a child and helping them to develop their minds and morals in a way that will benefit them their entire life. Co-author Tina Payne Bryson has a wonderful 5-minute video on Youtube (search no-drama discipline) that beautifully summarizes the no-drama discipline approach. If you're even a little curious about how to handle the next time your toddler (or teenager) has a melt-down, I would highly recommend it! I feel really ambivalent toward this book. It’s heavily rooted in psychology, which I’m interested in and have some background in, so I enjoyed listening to it (I listened to this book on Audible). It seems to be highly associated with their other book, The Whole Brain Child, so maybe I should have read that one first. I have a 3 year old and a baby, so there are definitely quite a few things I took away that I can use in my relationship with my kids. However, I think if I had older kids and I h I feel really ambivalent toward this book. It’s heavily rooted in psychology, which I’m interested in and have some background in, so I enjoyed listening to it (I listened to this book on Audible). It seems to be highly associated with their other book, The Whole Brain Child, so maybe I should have read that one first. I have a 3 year old and a baby, so there are definitely quite a few things I took away that I can use in my relationship with my kids. However, I think if I had older kids and I hadn’t raised them the way the authors are proposing, I wouldn’t have found it very useful. As much as the authors write about setting limits and consistency, they seem to be against nearly all forms of punishment and/or consequences. I understand their premise that we tend to overuse consequences. But sometimes they are necessary. You can’t fix every bad behavior with a dialogue between you and your kids, and kids aren’t always cooperative enough to admit to any fault and be part of the discipline process. The book basically says if your kids don’t respond to this method of “connect and redirect”, or you are having more intense and ongoing behavior problems, you need professional help. In my opinion, that would be the vast majority of families. I did feel convicted by parts of this book. Our culture doesn’t typically want children to be anything other than happy, but that’s not real life. Children experience a full range of emotions just like adults do, and they are entitled to “feel their feelings” and still know they are loved unconditionally. This book is thought-provoking, and inspired me to be more thoughtful and deliberate in disciplining my two boys. However, it also made me feel better about the job I am already doing as a parent, as I already use a lot of the strategies suggested in this book, including getting down to their eye level and helping them talk about their "big feelings" (and my wife is just naturally a masterful mom because she naturally does almost all of it). I also appreciated the repeated acknowledgement that e This book is thought-provoking, and inspired me to be more thoughtful and deliberate in disciplining my two boys. However, it also made me feel better about the job I am already doing as a parent, as I already use a lot of the strategies suggested in this book, including getting down to their eye level and helping them talk about their "big feelings" (and my wife is just naturally a masterful mom because she naturally does almost all of it). I also appreciated the repeated acknowledgement that even the authors are not always great parents. I often lose my temper, and generally default to timeouts for discipline. The authors try to convince parents to shun timeouts altogether, and I disagree there. I have found timeouts are often very helpful with my 5-year-old. He sometimes just needs a few minutes of quiet relaxation to calm the storm in his brain. However, other suggestions in the book are more helpful, and I will try to follow their lead by taking more time and thought with my disciplinary practices. It's hard to do that in the moment, but they also repeatedly remind parents that discipline doesn't have to be immediate. It's ok to take time to formulate an appropriate response. Oct 2018: I’ve been really concerned about how to help my kids to be able to really process their emotions - I’ve also struggled with different disciplinary techniques. This approach is exactly what I need at this time. I’ve already started to use bits and pieces and have seen big differences with my toughest little guys. This book was so disappointing. I thought "The Whole-Brain Child" was excellent. It was informative yet engaging, and never dull or boring. This book, on the otherhand, was a chore to read. And it didn't really contain any new insights from The Whole-Brain Child. It took some concepts already discussed and expanded on them ad nauseum. It felt like a money grab. Being a grandparent isn't easy, turns out. Especially if you raised sons but the majority of your grandchildren are girls. It shouldn't make any difference, right? Full disclosure: I'm an ardent feminist who cannot ignore the differences in emotionality I witness in granddaughters. The best word for it? Drama. Big time. And I have zero experience with and little patience for it. Thus, this book found its way into my Kindle. Every generation has a new take ...sometimes evolut Being a grandparent isn't easy, turns out. Especially if you raised sons but the majority of your grandchildren are girls. It shouldn't make any difference, right? Full disclosure: I'm an ardent feminist who cannot ignore the differences in emotionality I witness in granddaughters. The best word for it? Drama. Big time. And I have zero experience with and little patience for it. Thus, this book found its way into my Kindle. Every generation has a new take ...sometimes evolutionary and sometimes revolutionary .. on how to best raise children. Discipline is always a challenge. And while we may subscribe to the "discipline equals teaching" school, figuring out what that means in practice is another thing altogether. I was drawn to this book as much for the subtitle as to the idea of reducing drama. Whole-Brain. What's that? I'm an evidence-based person by profession (a retired nurse practitioner) while also recognizing the limitations of supposed "evidence" alone as the basis for improving human interactions. The field of psychology in particular has had a difficult time attempting to be "scientific" with something as multi-factorial as human behavior. And its history is riddled with things once proven that haven't held up over time (even one study referenced in this book, about children and impulse control). But this relies much more on neuroscience and what we have learned about how the brain works as the foundation for understanding children as they grow and develop. This I can buy into because much of what is referenced here has corollaries in working with adults with neurological diseases/injuries, addictions, and the like. As I read this, I wished I could go back in time to inform my own child-rearing practices. I missed so many opportunities to help my kids develop the way I intended. I've missed more than a few too with my grandchildren. The idea that a kid's brain is incapable of helping them control emotion and learn better behavior at the same time, is a simple one. But it is also profound. The point made about the propensity to lecture, to overwhelm kids with words, especially when they are utterly incapable of getting past the momentary chaos of their emotions, resonated so much with me. We want kids to develop empathy ...so we tell (yell?) them to "be nice to your sister!". Right. Like that works. But most of us lack the tools we need to assess the mess our kids are in when they are sucking us into the vortex of their drama, let alone figure out what to do once we figure out what's happening. We get angry and have little insight into our own emotions and triggers. My granddaughter is hitting the buttons my spoiled sister always did? Ah ... yup. And those responses color how we behave, and it often isn't exemplary behavior. This book walks you through a terrific model for improving your disciplinary style while challenging you to let go of what you think you know about how to correct bad behavior. The biggee? Punishment is not the goal. Suffering consequences is not the outcome. What? Really, you have to read it to get it. The authors offer lots of examples of situations that are so common, I could instantly recognize them and recall both my feelings at the time and what I did right ..and wrong. They do not beat up on imperfect parents, but offer a more structured way to dig out from under your own chaos to reduce the drama and improve the learning so your child (or grandchild) can become the person you hope they will be. Helping kids gain the ability to self-manage strong emotions (and not deny having them), to put themselves in others' shoes, to collaboratively problem-solve with a parent (and others) when conflict arises. These are life skills and I agree that this should be the ultimate goal of discipline. I really loved this book. I read an e-copy but think a hard copy would be useful since there are lists and tips in the back that you can put on the fridge (or take a pic of and put into your phone!) so that you can remind yourself how best to approach a break-down. This isn't a book you'll read once and then put on the shelf. It's a guidebook that I can imagine looking to often, especially when you tried to discipline well and it didn't work. They are quite clear that things don't always work as intended. That alone is refreshing. This book also isn't just for little kids. It can work into adolescence and beyond. In fact, I think it could benefit the husband-wife relationship as well, since so often the topic of disciplining kids is a stressor for marriages. The authors offer a workbook and I'm going to look at that as well. I think it would be helpful to try to do some scenarios to practice thinking in a new way. I also intend to check out their book "The Whole-Brain Child". Teachers could likely benefit from the work of these authors too; several examples of using this in schools are cited in the book I read. Appreciated this book as it seamlessly complemented the authors' first book, "Whole Brain Child." "Kids need us to set boundaries and communicate our expectations. But they key here is that all discipline should begin by nurturing our children and attuning to their internal world, allowing them to know that they are seen, heard, and loved by their parents - even when they've done something wrong." 1) Why did my child act this way? 2) What le Appreciated this book as it seamlessly complemented the authors' first book, "Whole Brain Child." 2) What lesson do I want to teach in this moment? 3) How can I best teach this lesson? I absolutely love the theory and philosophy of this book, the information on how brains develop and what parts of our brain are triggered during conflict. In the perspective of psychology its interesting to me as well as the childcare. And I like the suggestions of how to stop and think of the situation where the child is triggered and why they may be, depending on their age and abilities and what your thought process should be, how to use your "upstairs" brain. However since reading How To Talk I absolutely love the theory and philosophy of this book, the information on how brains develop and what parts of our brain are triggered during conflict. In the perspective of psychology its interesting to me as well as the childcare. And I like the suggestions of how to stop and think of the situation where the child is triggered and why they may be, depending on their age and abilities and what your thought process should be, how to use your "upstairs" brain. However since reading How To Talk so Kids will Listen and Listen so Kids Will Talk I've realised the journey to practical use of the ideas are not straightforward here, like in the latter. I think the combination of both are key to actively making use of the information and having strong relationships form. The book contains some great material. There were a lot helpful ideas. But, when the authors talk about redirecting it seemed like manipulation. Obedience isn't required, unless the parent can give a valid negotiation. Make the child think what we do depends and whether they want it. Child kicks parents. Parent says that hurts. But don't tell them not to hit? Or hitting is bad? Summary: No boundaries, no limits. Only natural consequences. And lot of negotiations. I thought this was a very helpful book. I read it right after "How to Talk so your Kids will Listen and How to Listen so Your Kids Will Talk" and they complimented each other really well. I have started using some of the ideas with my kids with really good results. I'm still working on integrating more of the ideas and finding the ways these practices work best with my set of kids, but so far I'm impressed.